Note: You can enter this giveaway three (3) times per e-mail address per day. Deadline is 11:59PM ET 11.7.17. Do you believe in magic? If you don’t, you will once you try the Magic Bullet NutriBullet Blender. 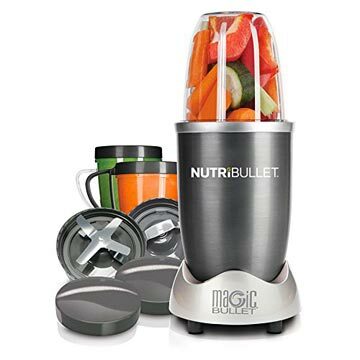 This blender features a small cabinet footprint but boasts a 600-watt motor that effortlessly pulverizes fruits and vegetables for super-smooth Green Smoothies. The magic lies in the patented blade design and its cyclonic action. Simply add your favorite fruits, vegetables, nuts and other favorite ingredients to the NutriBullet along with liquid and in seconds you have a healthy, tasty drink. On those days when you feel like being less than healthy, this Pineapple-Tequila Smoothie can be whipped up with a wave of the magic wand. NO PURCHASE NECESSARY TO ENTER OR WIN. Void where prohibited by law. Open to legal residents of the 50 U.S., D.C. and Canada (excluding Quebec) who are at least eighteen years old at the time of entry and have internet access. Begins on 9.12.17 at 12:00:00 a.m. ET and ends on 11.7.17 at 11:59:59 p.m. ET. To enter the giveaway, submit your full name and email address on this form. Odds of winning this giveaway depend on the total number of eligible entries received. Only three (3) entries per email address per day. Sponsored by Leite’s Culinaria, Inc. For more information, visit our Official Rules. For a list of winners, check out our Very Happy Winners page. Be sure to add giveaways@leitesculinaria.com to ensure notification if you are the winner.